The episode starts with agni dev going to burn the twig. Agni dev says who are you woman? You challenged us gods to move this twig from its place? I am agni dev, the god of fire, I control it and I will burn this twig and also pull you r shakti inside myself. Gauir says don’t just speak, do what you said. Agni dev uses his fire and throws at the twig. The fire goes and twig doesn’t burn, agni dev is shocked. Agni dev says this is a maya but you cant stop my power. Agni dev uses all his strong fire powers and attacks the twig, the fire burns for a long time. Agni dev says this time it has burned for sure. Gauri says lets see and she starts pulling the fire in herself. The fire goes and the twig is untouched, agni dev is shocked, gauri says go and tell all gods to come and try to move that twig. You were egoistic agni dev. Agni dev goes. Indra dev gets angry and says how dare she challenge us? I am devraj and that mayavi woman shall know our powers. The gods go to move the twig. Kartikeya says the gods were blinded by ego so much that they still thought mata gauri was a mayavi power, but they were about to learn a lesson. The gods gather and go to the twig and mata gauri. Vishwakarma sees everyone. Varun dev comes ahead and uses his power, he throws water on the twig and says it will for sure move it. But the twig doesn’t move and varun dev and everyone is shocked as when the water touched the twig, it turned to steam. Suryadev comes and he tries to move the twig using his sun power but he fails too. kuber dev uses his gadha and hits the ground with all powers but the twig doesn’t move even a bit. Kuber is angry and shocked. Mata gauri says it has not yet moved. Vishwakarma thinks this is no demonic power, it is a divya power. Indra dev comes. ganesh says devraj was getting angry and he decided to try. Mata gauri says you gods can do nothing. Indra dev says you woman, in front of my power let the twig alone even you cannot stand in front of me. indra dev takes vajra astra and he brings lightning, indra dev attacks it on the twig with all force. But nothing happens to the twig and in turn a blast occurs and mata gauri takes all lightning and returns it to the sky. The clouds thunder. Indra dev says who are you? mata gauri says I am that whose power lies within you all, mata gauri reveals her form. all gods are shocked and they do pranam. Mata gauri says I am who gave you the capability to defeat demons but you had become egoistic so I wanted to remind you what you have to be, the power you had ego on is me! I am that power. The gods apologize and say we have done a great mistake mata, forgive us. Ganesh says after that, mata had given them a lesson and the gods asked for forgiveness but mata was still angry so the gods prayed and sang a song to mata gauri and she calmed down and forgave the gods. Mata gauri says I forgive you all because you are gods and you have a responsibility towards this world, always remember it and do your duty. 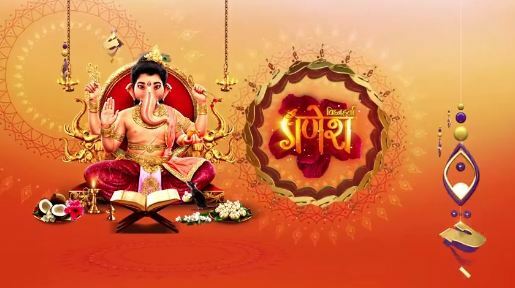 Ganesh says whoever prays to mata, their sins in last life also are gone and any sorrow, sin and crime you do in future, wont even come near you. ganesh says now we shall pray and do her aarti. ganesh and everyone do aarti of mata gauri as devi sarla sings the prayer song. Mahadev is meditating. Ganesh and kartikeya to adishakti and say we told raja devodas and devi sarla the story of your 8th avatar, so bless us that we complete your recitation and our plan succeeds. There gods say to tridev, we are getting weaker, devi of ved is not there and the ved is going from this universe. Indra dev says this problem will be solved if raja devodas understands his mistake and mahadev and devi adishakti come together again. Kartikeya says what if that doesn’t happen? I am worried for that. Lord Vishnu there says a disciple’s bhakti never fails and navratri poojan shall finish with all bhakti, so this problem will be solved too. ganesh says to kartikeya we shouldn’t get into doubt brother because we don’t control the future, what is written has to happen so if we pray and do our bhakti then we shall succeed fir sure. Devi sarla says I am excited to listen to the 9th avatar of devi adishakti. Ganesh thinks even I am because then raja devodas shall realize his mistake. Ganesh says mata’s 9th form, which means, Mata Siddhiratri. Precap: ganesh tells the story of mata siddhiratri which is the last and 9th form of devi adishakti.